Mind and Body Environment is an installation artwork about the act of visual objectification. An ominous kinetic sculpture in the shape of a head looms above gallery visitors. 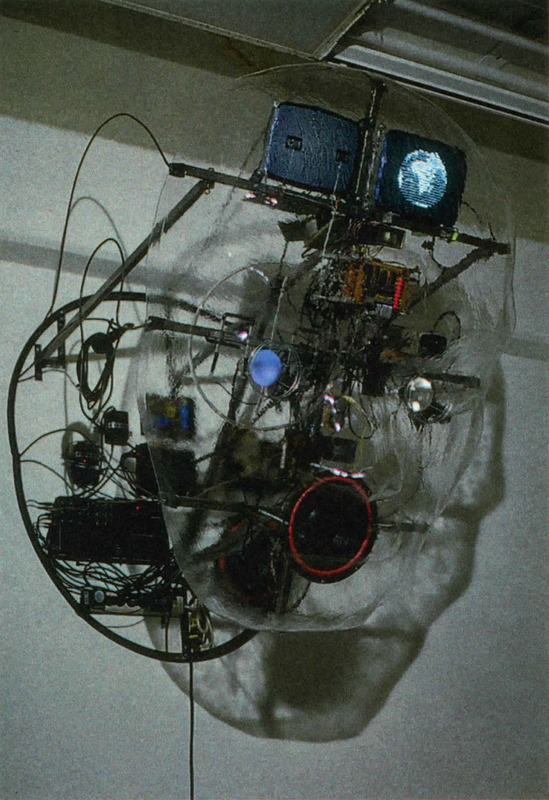 Behind its transparent face are various media devices that replace body parts and a neon circle and crosshairs that symbolizes gun sights, missile targeting systems, photographic scopes, and cinema camera viewfinders. 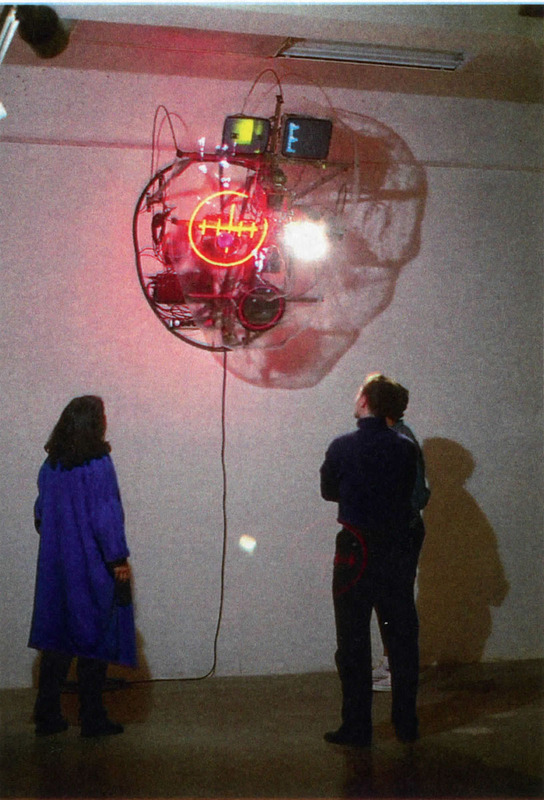 The sculpture makes targets out of its viewers and attempts to locate, analyze, and react to the movements and sounds they make within the space. It has the capacity to capture and control the visual and acoustical representation of its audience. There is a long history in the visual arts of investigations into the act of looking. This work takes specific inspiration from Edouard Manet’s paintings of The Execution of Maximilian (1868) and Olympia (1863), and from the technological arena of modern conventional war machines — where seeing is destroying. On the political level, the sculpture references the national leader who uses a network of information such as satellite surveillance (or media polling) to monitor enemy position, and then orders manuevers to be carried out by weaponry (or campaign specialists) in remote locations. On a personal level, it can be a metaphor for a thought process that occurs when looking at another human being, object, or ideology. The installation is meant to provoke ideas about the borders between logic and instinct, local interest and global responsibility, and the mind and body.